The Sanctuary Renewal project was launched in 2012 with the realization that the 47-year-old Trinity Lutheran sanctuary needed to be refreshed. The entry was pinched and not welcoming; the restrooms were sad and tired; there was no accommodation for persons using walkers, canes or wheelchairs. The sound system was reliable, but we had no way to project words or images on a screen. The altar and pastor were far-removed from the congregation; and the pews, while beautiful, limited the use of the sanctuary for functions other an worship. We hoped to reshape the chancel into a more flexible space: we would bring the Pastor closer to the congregation. An extended dais could be an invitation to liturgical dance, music concerts, children’s Bible messages. The removal of altar rails would send a message that God’s grace was available to all. Chairs arranged around the extended dais would create a warmer, more intimate feeling. With an awareness that many members and visitors have mobility problems, we would expand our restrooms, making them more accessible and comfortable. At the same time, our architect would design an accessibility ramp to allow wheelchairs to easily attain the chancel area. A new audio-visual system would be created; the entryway would be deepened and made more welcoming; the chancel would be brought closer to the congregation, with chairs encircling the extended dais. Today, these goals are about to be realized. With the successful “ Appeal” campaign, the actual construction will begin in January of 2018. Thanks to so many of our members and friends, we have reached more than 50% of our goal of $900,000 for the renewal, with many pledges remaining to be fulfilled in 2018 and 2019. Thank you to everyone who contributed to the Renewal campaign! fall, 2012: Church council establishes a sanctuary renewal task force to consider options to renew Trinity’s worship spaces. October, 2014: Final report of the tast force. A Sanctuary Renewal Committee is formed. 2014 – 2015: Two architectural firms are hired to develop plans for the renewal project. spring, 2018: Consultant Tim Johnson of “Kairos” is retained to guide the congregation through the renewal. CAT survey confirms congregational approval to move forward with renewal project. Congregational meeting affirms priorities for 11 suggested projects and approves launching the Appeal for funding. Campaign for contributions to the renewal projects begins. Expected start date for demolition and reconstruction of sanctuary restrooms. Expected start date for renewal of sanctuary nave and chancel. Questions or Feedback? Click Here! Click here to view weekly updates from the campaign period! Cost and design information for Sept. 18th special congregational meeting. In the fall of 2012 Trinity Church Council established a sanctuary renewal task force to explore options to renew Trinity’s worship spaces. Based on extended discussions and exchange of ideas, the task force prepared a report detailing opportunities for improvement the narthex, nave, and restroom facilities. The task force recommended retaining an architect to develop initial designs, working with an organ builder to determine the feasibility of moving an organ to the front of the sanctuary, and assessing the composition of the popcorn ceiling material. Members of the congregation council and the renewal task force have taken action on these recommendations by soliciting congregational feedback during ‘brainstorming’ meetings, discussing the technical details of the proposed projects with architects, organ builders, and AV specialists. Based in this information a preliminary budget for each element of the plan. The refined set of priorities and proposed budget were presented at a special congregational meeting in January 2016. To help lead the congregation through a period of discernment about how the proposed renovations align with our mission and vision, the council selected Tim Johnson, a consultant with Kairos and Associates. During a ‘listening’ period the congregation considered key interests and priorities. Feedback from this process has been used to guide the priorities of the renewal program as we move forward. Members of council and the sanctuary renewal committee worked closely with architects Pete Ehlen (based in Santa Barbara) and Susan Jones (based in Seattle) and organ builder John Hupalo to refine design concepts for renewing the sanctuary space, merging the Grace and Trinity organs into a new organ, and modernizing the restrooms to improve accessibility. 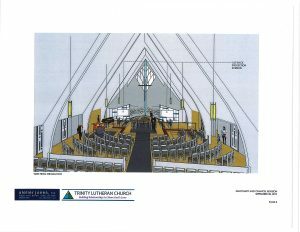 Interim design drawings were presented to the congregation following the annual meeting in early June. Based on extensive discussion and feedback from this meeting, the architectural committee worked with the architects to further refine the designs. Nave and Chancel: Many aspects of the sanctuary renewal proposal focus on improving the flexibility of our worship spacing while improving acoustics and creating a more intimate environment. A key element involves building a new organ in the front of the sanctuary based on components of the existing organ and pipes from the organ removed from Grace Lutheran Church. Narthex: The renewal program aims to make the narthex more open, inviting, and less cluttered. Restrooms: Ensuring that restrooms meet accessibility standards while improving comfort has been ranked as a very high priority.